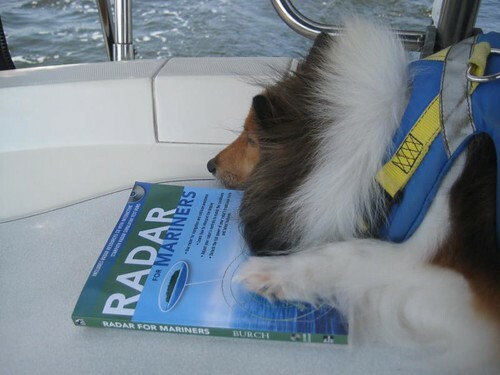 My sister’s sheltie, Bailey, is a rather experienced sailor– he and his “parents” have just left their summer land berth near Annapolis for another venture down the Atlantic coast and a winter in the Bahamas. Not to shabby a life. I am hoping to catch up with them again in the Spring like I did last year — if Bailey will let me on board. I’m rather proud of my “little/big” sister (little cause she is smaller, big cause she is older) who has seriously taken up blogging/flickr posting/google mapping to record their travel and stay in touch with friends… wow, sailors are really a connected network on many levels- she gets more regular comments than I do! Like a good blogger, Harriet is compulsive to post, not always easy when the internet is spotting. Follow sailing Bailey at http://moondance38.wordpress.com/. I am hoping when I see him in the Spring, that Bailey can explain radar to me…. Maybe your sis would consider geotagging her photos now that she is a blogging an flickr pro. They could do some cool mapping mashups of their trips. Sounds interesting…how do I geotag my photos? The fancy way is getting an expensive camera with GPS that does this automatically; other people do it by carring a portable GPS tracker, and use software that can sync the time of a location to the time you took a picture. However, the easiest way, and what I recommend, sis, is to use flickr’s built in map tools. If you click on the Organize link on the top and go to map, you can select a whole batch of photos, find a location on the map that matches where you took them, and drop them into the map location– this adds geo location to all the photos, and then you can create a map view of all your photos.